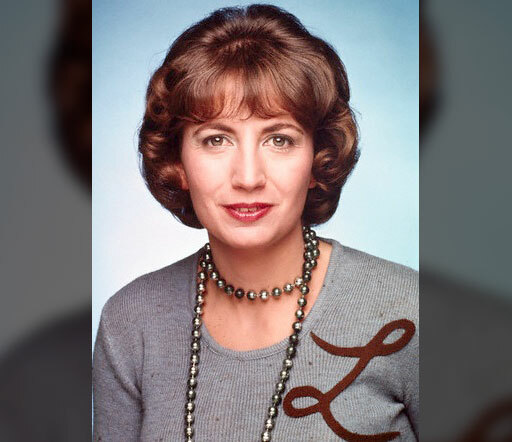 Penny Marshall as "Laverne DeFazio"
TMZ is reporting that iconic actress and director Penny Marshall, of Laverne & Shirley fame, has passed away at the age of 75. The reported cause of death was complications from diabetes. Marshall’s first big splash came as a recurring role on the popular TV series, The Odd Couple, where she played “Myrna Turner” in 27 episodes. But an appearance on the red-hot Happy Days in 1975 as “Laverne DeFazio” (with soon-to-be longtime sidekick Cindy Williams as “Shirley Feeney”) was so popular, the duo were spun-off in their own series, Laverne & Shirley. The series would run for 8 seasons with Marshall earning 3 Golden Globe nominations along the way. The ABC series was originally set in Milwaukee, but moved to Burbank in season six. Throughout the series, Marshall would wear her trademark “L” for Laverne on her sweaters becoming one of the most famous logos in television history. But acting was just the beginning of Marshall’s career. Following her brother, Garry, she was soon directing hit movies, beginning with 1986’s Jumpin’ Jack Flash starring Whoopi Goldberg. But it was her second film, Big, starring Tom Hanks that made her an A-list director in Hollywood as she became the first female director to have a film gross over $100 million at the U.S. box office. She would go on to helm such hits as A League of Their Own (1992) starring Geena Davis, Tom Hanks, Madonna and Rosie O’Donnell (which also grossed over $100 million); Awakenings (1990) starring Robin Williams and Robert De Niro, which would garner three Oscar nominations including one for ‘Best Picture;’ and The Preacher’s Wife with Denzel Washington and Whitney Houston in 1996. Marshall was married to actor/director Rob Reiner from 1971 to 1981. According to TMZ, Marshall’s family issued a statement which read, "Our family is heartbroken over the passing of Penny Marshall. Penny was a tomboy who loved sports, doing puzzles of any kind, drinking milk and Pepsi together and being with her family." She had previously been treated for brain and lung cancer back in 2009. In addition to acting in A League of Their Own, Madonna contributed a new song, “This Used to Be My Playground,” for the closing credits. The single hit the top of the Billboard Hot 100 becoming Madge’s 10th number one single. Mourning the loss of a funny, poignant, and original American voice. Penny Marshall was a pioneer in television and the big screen who understood humor comes in many forms and some of life's deeper truths require a laugh. She will be missed. May she RIP.